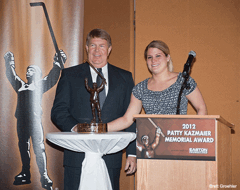 Junior forward received the award during a sold-out brunch ceremony at the Greysolon Ballroom in Duluth, Minn.
DULUTH, Minn. – Brianna Decker (Dousman, Wis.), a junior forward from the University of Wisconsin, was today named the 2012 Patty Kazmaier Memorial Award winner. In its 15th year, the award is presented annually by The USA Hockey Foundation to the top player in NCAA Division I women's ice hockey. 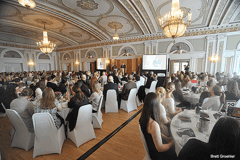 Decker received the award during a sold-out brunch ceremony at the Greysolon Ballroom in Duluth, Minn. She was chosen from a group of three finalists that also included junior forward Jocelyne Lamoureux (Grand Forks, N.D./University of North Dakota) and senior goaltender Florence Schelling (Oberengstringen, Switz./Northeastern University). "Brianna has meant a lot to our team this season," said Mark Johnson, head coach at the University of Wisconsin. "She was so consistent and gave us a chance to win every night. I'm very happy for her and her family." Amidst a standout season, Decker has been near the top of the NCAA leaderboard in all offensive categories and helped lead the Badgers to the NCAA national championship game where they'll face the University of Minnesota tomorrow at 3 p.m. CT at Amsoil Arena in Duluth. Through Friday's (March 16) national semifinals, she is ranked first nationally in goals (37), tied for third in assists (45) and is one of only three players in Division I women's ice hockey to average more than two points per game (2.11). In addition, Decker has five game-winning goals and 36 multi-point games. Decker, who has helped the UW to a 32-4-2 record and the No. 1 ranking in the USA Today/USA Hockey Magazine Women's College Hockey Poll in 22-of-23 weeks, also played a significant role in helping the Badgers to their second straight WCHA regular-season championship. In the University of Wisconsin record books, Decker currently ranks fourth in career game-winning goals (20) and is tied for third in career shorthanded goals (5). In Western Collegiate Hockey Association play, Decker tallied 54 points (20-34) in 28 conference games en route to being named the WCHA Player of the Year. Her 1.93 points per game and five game-winning goals both ranked second during league play. Decker's efforts also helped her earn All-WCHA First Team honors for the second straight year. Off the ice, Decker volunteered at the annual Hunger Fight Drive, along with the Bucky's Kid Clinic and "Skate with the Badgers." 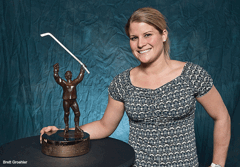 NOTES: Brianna Decker is the fourth Patty Kazmaier Memorial Award recipient from the University of Wisconsin. Meghan Duggan won the award last year, while Jessie Vetter captured the award in 2009 and Sara Bauer was named the recipient in 2006 … Decker is the fifth WCHA player to receive the award ... The 2012 Patty Kazmaier Memorial Award brunch, presented by Easton Foundations, was held in conjunction with the NCAA Women’s Frozen Four, which will conclude tomorrow (March 18) with the national championship game between Wisconsin and Minnesota at 3 p.m. CDT at Amsoil Arena in Duluth, Minn. The game will be broadcast live on NCAA.com ... Julie Chu, winner of the Patty Kazmaier Memorial Award in 2007 and three-time Olympian, was the keynote speaker for the award brunch and Laura Kennedy, a sports anchor and reporter for WDIO (ABC) in Duluth, Minn., served as the master of ceremonies ... The award ceremony was streamed live at USAHockey.FASTHockey.com and an archive of the broadcast can be found there ... The Patty Kazmaier Memorial Award recipient is chosen by a 13-member selection committee comprised of NCAA Division I women’s ice hockey coaches, representatives of the print and broadcast media, and a representative of USA Hockey, the national governing body for the sport of ice hockey in the United States ... USA Hockey and the NCAA will team up once again to put on a free girls' skills clinic in conjunction with the Patty Kazmaier Memorial Award and the NCAA Women's Frozen Four. The event will take place today at the Mars Lakeview Arena from 4:30-5:30 p.m. CT. A Try Hockey for Free clinic will follow from 5:30-6:30 p.m.
An award of The USA Hockey Foundation, the Patty Kazmaier Memorial Award is annually presented to the top player in NCAA Division I women's ice hockey. Selection criteria includes outstanding individual and team skills, sportsmanship, performance in the clutch, personal character, competitiveness and a love of hockey. Consideration is also given to academic achievement and civic involvement. The Patty Kazmaier Memorial Award is supported, in part, by a grant from the NHL Foundation.